More Mumbai Street Food that I've tried during other visits to Mumbai, India, continuing from Part 1. 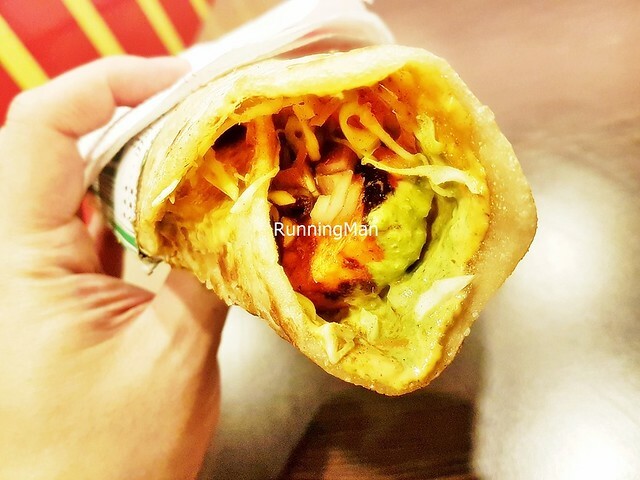 This list includes dishes not listed in Mumbai Street Food - Part 1. While cuisine is mostly West Indian and South Indian, there are also influences from North Indian cuisines. 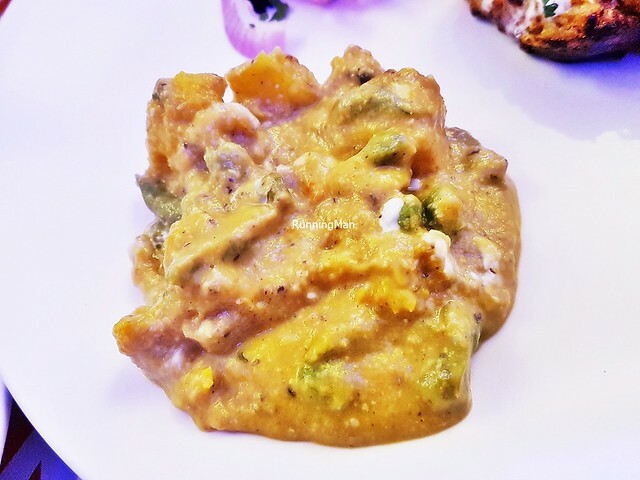 The North Indian dish of Aloo Mutter is often served as a side dish, accompanying Indian breads. 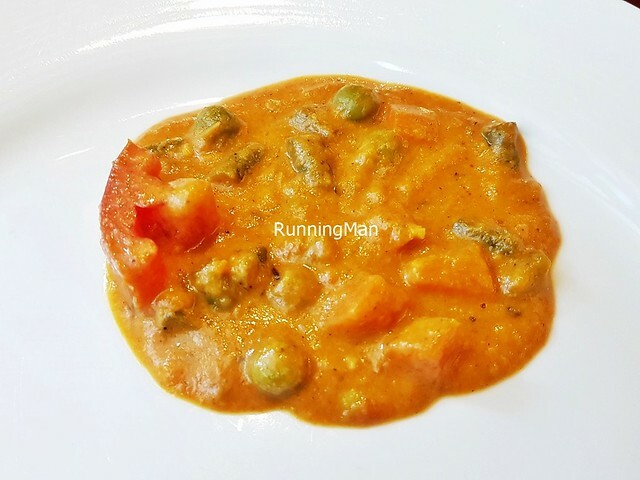 This vegetarian wet curry is made with potatoes, peas, tomatoes, garlic, ginger, onions, powdered cumin, powdered turmeric, cashew nuts, and coriander. 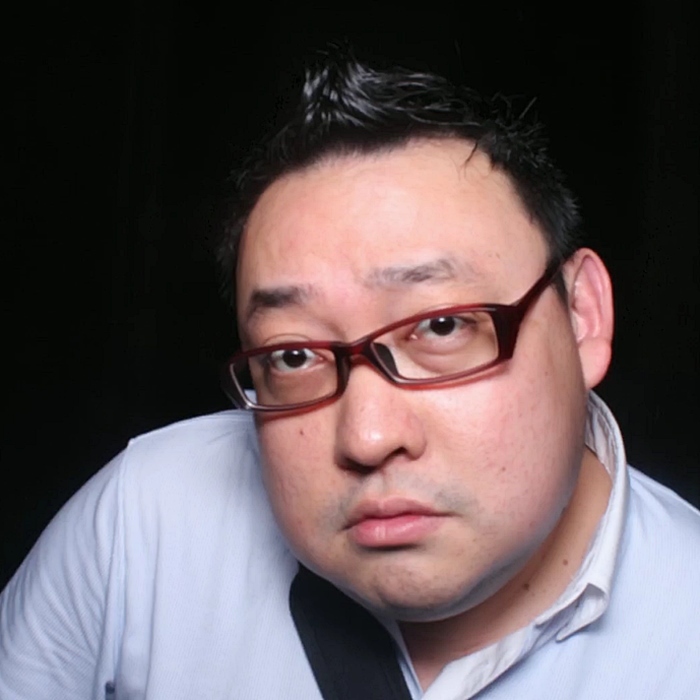 It's usually mild, with a savoury sweet taste and no spicy heat, and is quite light in texture. 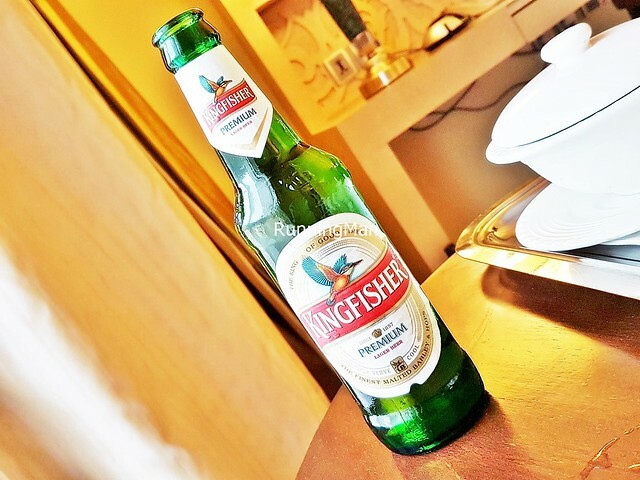 Brewed in India, the Beer Kingfisher Premium is a pale golden ale with a carbonated body, tastes of sweet grain and metallic minerals, very light without much bitterness. Great for hot weather, very refreshing, but weak as a beer. 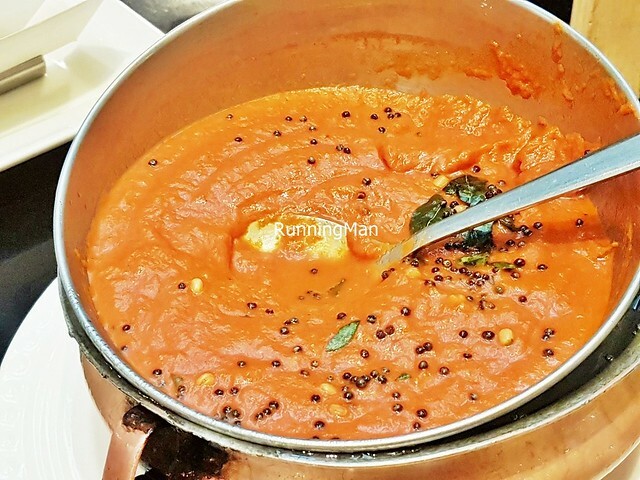 Different types of Chutney are available, usually served together with any South Indian meal. These include the earthy, nutty Chutney Coconut; the grassy, herbal Chutney Coriander; or the fresh, bright Chutney Tomato. 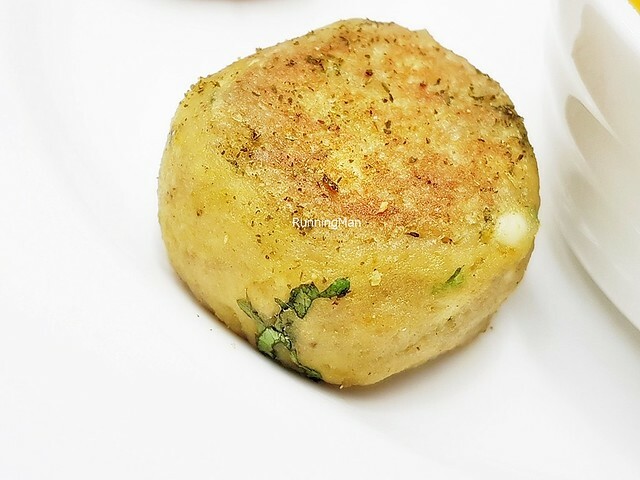 The Kurkuri Aloo Tikki is essentially a crisp outside, soft inside, fried potato fritter, either eaten on its own as a snack, sandwiched between bread like a vegetarian burger, or served as a side dish with white rice. 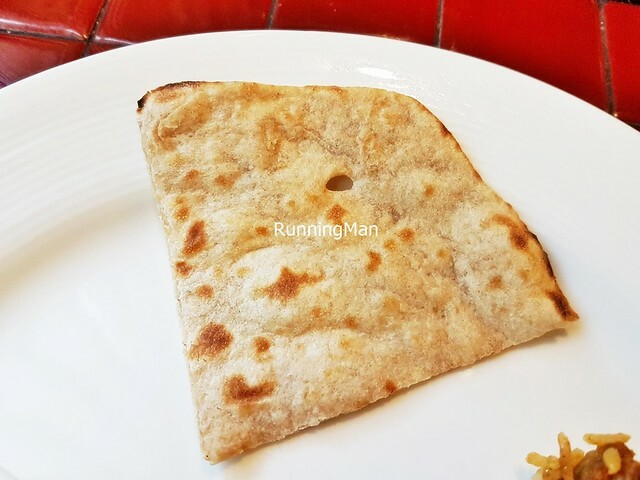 It's made with potatoes, peas or corn, all-purpose flour, ginger, salt, chili, powdered cumin, powdered cinnamon, cloves, powdered cardamom, pepper, bay leaves, mace, and nutmeg. 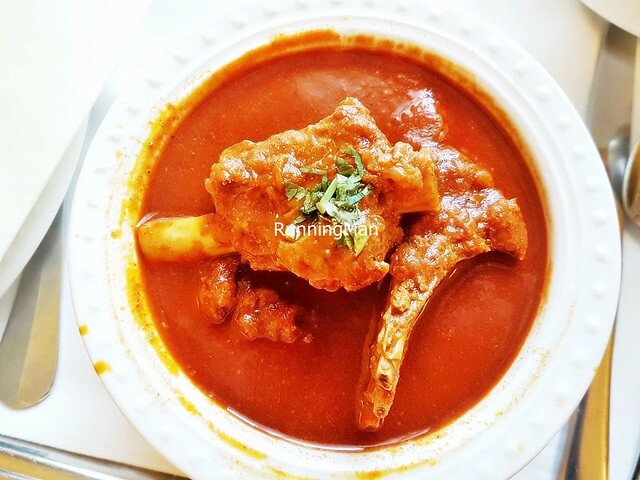 The Laal Maans is a fiery, spicy mutton wet curry dish, which originated from Rajasthan, India. 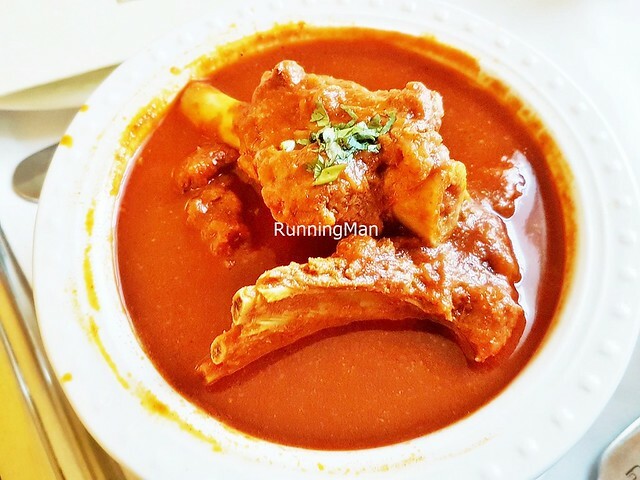 Chunks of mutton are simmered in a spice mix of chili, onions, garlic, salt, coriander, powdered cumin, powdered cinnamon, cloves, powdered cardamom, pepper, bay leaves, mace, and nutmeg, until the meat is super tender and comes easily off the bone. 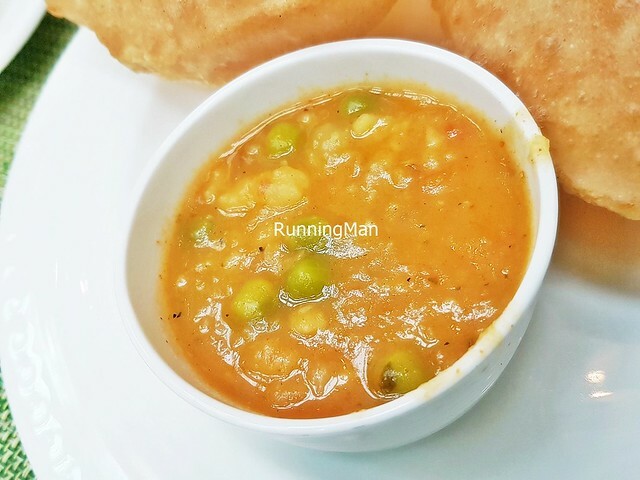 The hot, thick curry gravy is usually eaten with Indian breads. Not for the faint of heart, as the spice burn lingers quite awhile, building in intensity with every mouthful. 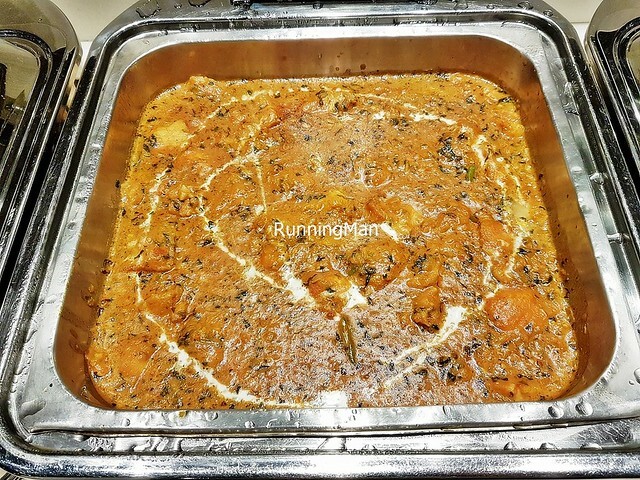 The Methi Machali, also known as Methi Machli, is a fish and fenugreek wet curry dish. 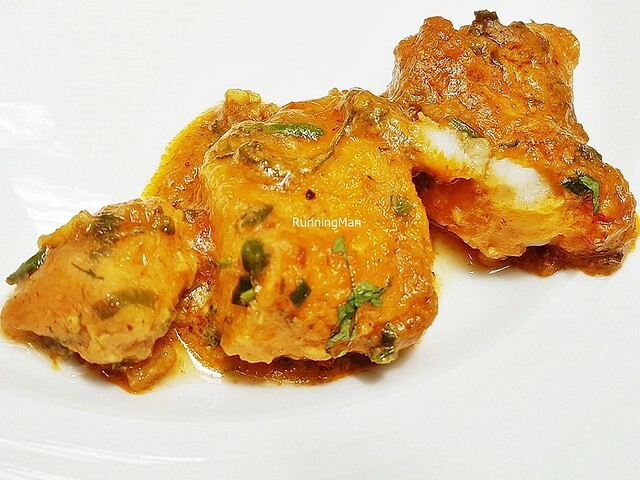 Chunks of firm, white fish fillets are cooked together with yoghurt, powdered turmeric, lemon juice, onions, fenugreek seeds, ginger, salt, cumin seeds, coriander, and mustard oil. The result is a mild wet curry, savoury yet light, which pairs well with Indian breads or rice. 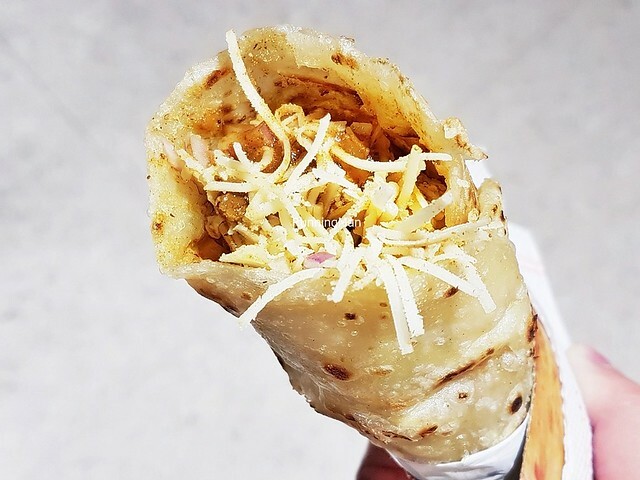 Inspired by the wraps of International cuisine, the Frankie is a hand-held wrap that originated in Mumbai, and is quickly becoming a popular, practical, modern street food. 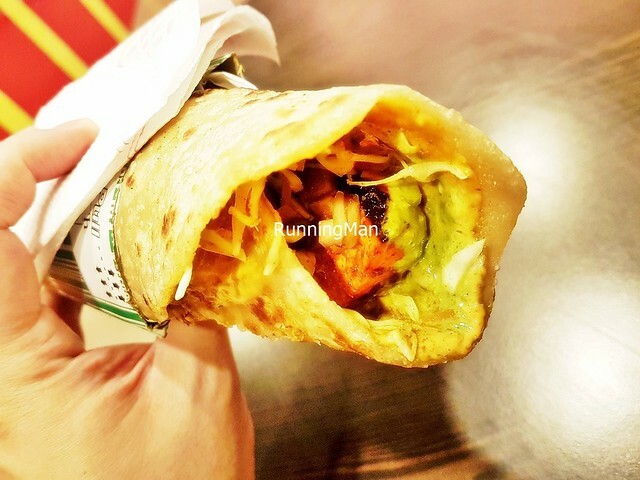 The vegetarian Paneer Tandoori Tadka Frankie features thick, grilled till smoky savoury pieces of paneer cheese, marinated in spices, and stuffed with shredded cabbage, onions, and a earthy coriander chutney into a crisp, fried roti dough. Pretty good meal on the go! 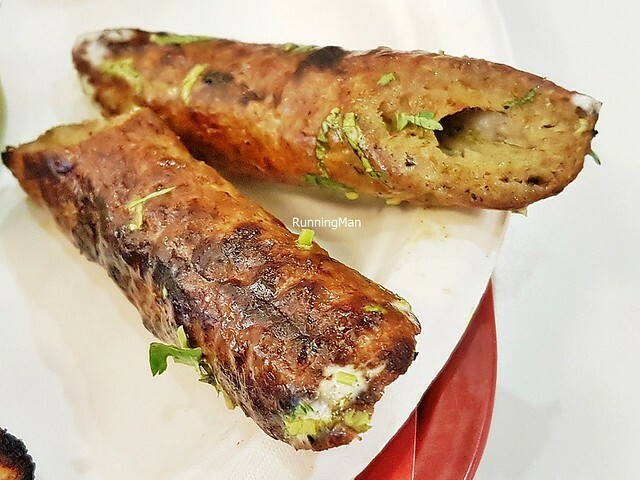 The Mutton Cheese Frankie features thick, grilled till smoky chunks of mutton, marinated in spices. Super tender and tasty, with bold savoury salty spicy flavour. Stuffed into a crisp, fried roti dough, along with with shredded cabbage, onions, and gooey string cheese. More filling than it looks! 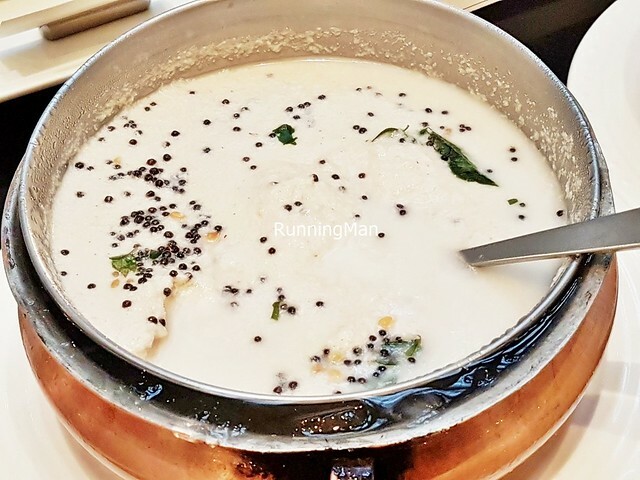 The traditional dessert of Parippu Payasam is made by boiling yellow lentils / mung beans, jaggery palm sugar, thick coconut milk, thin coconut milk, clarified butter (Ghee), crushed cashew nuts, sliced coconut, cumin seeds, cardamom seeds, and ginger. 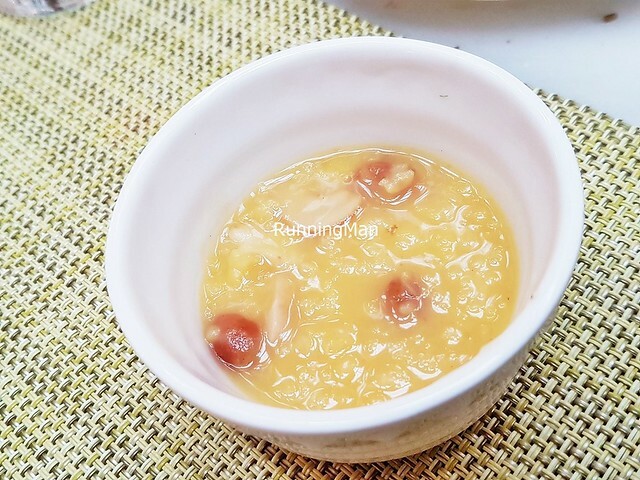 This thick, rich, sweet dessert has a texture similar to congee, and can be served either warm or chilled, but personally, I prefer it warm. 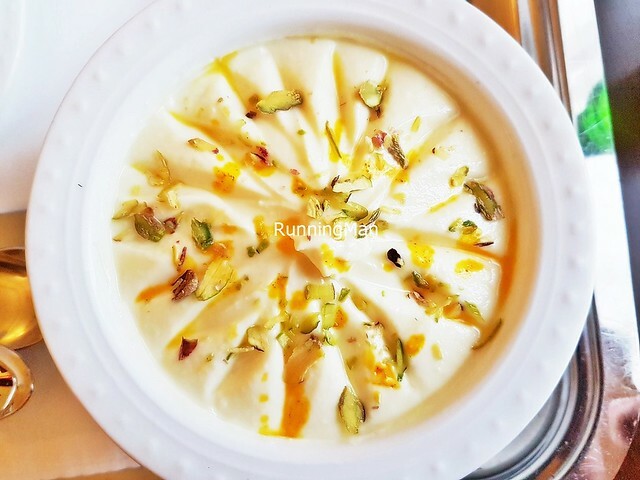 The Rice Kheer Milk is a sweet rice pudding dessert, made with white rice, full cream milk, condensed milk, sugar, powdered cardamom, raisins, chopped pistachios / chopped almonds, and sometimes saffron. 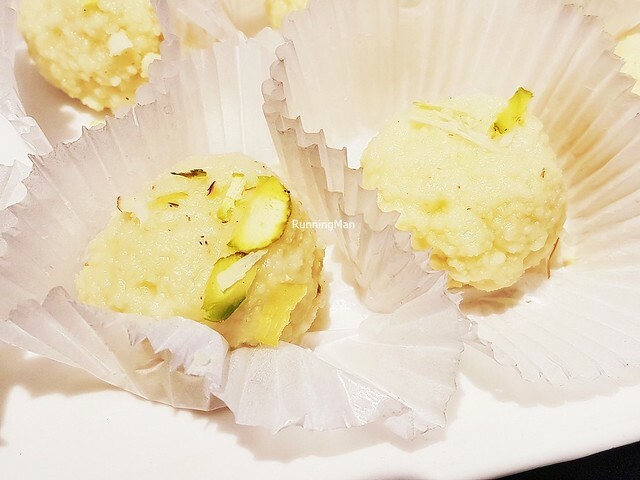 There are several different regional variations of this dessert throughout India. 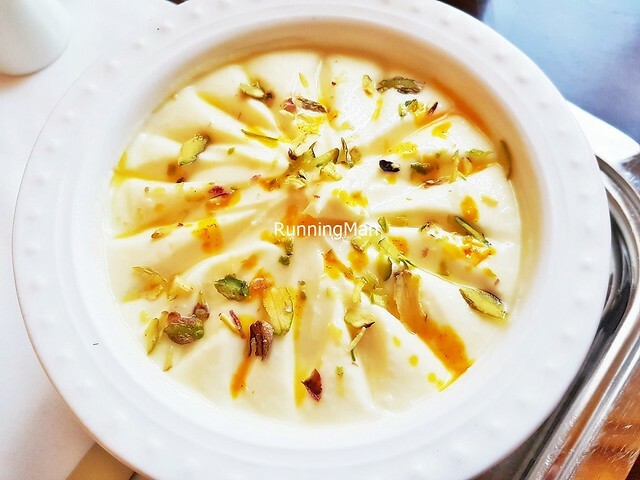 The Shrikhand is a royal Indian dessert, made with fresh strained yoghurt, mangoes, cardamom seeds, sugar, raisins, saffron, and crushed pistachio nuts. This rich, decadent dessert has a creamy smooth texture, with rich fruity sweetness, contrased by the crunch of the pistachios. 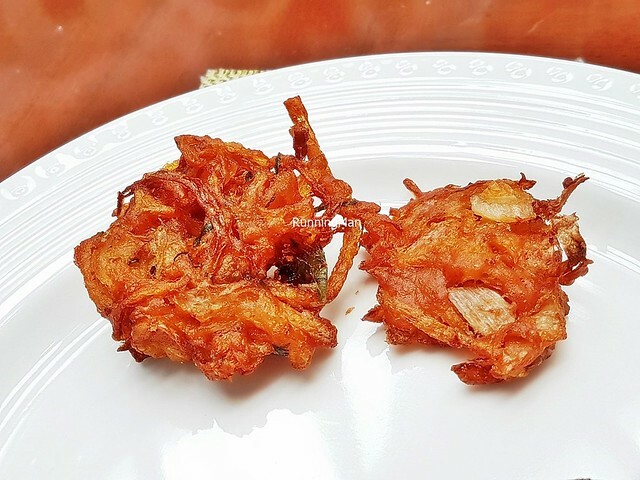 Today, is usually served as a wedding dessert, and works as a counterpoint to spicy curries. 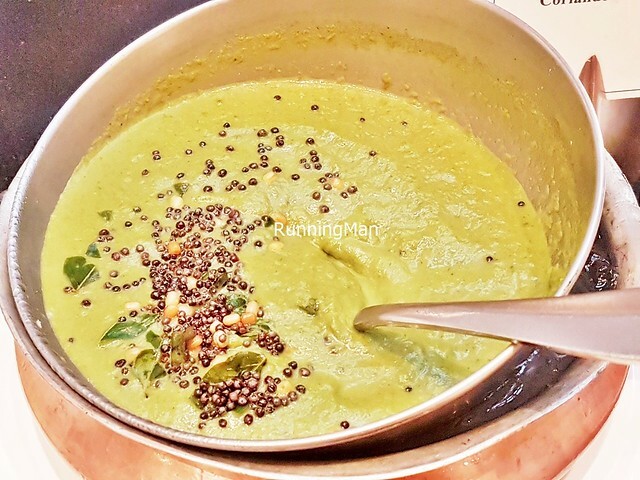 The Subz Kali Mirch is a vegetarian wet curry dish, consisting of carrots, tomatoes, peas, and coriander, in a mild, savoury sweet, peppery wet curry. Rather lovely with Indian breads or rice, and also somewhat healthy! The Thums Up cola was introduced in 1977, when Coca-Cola pulled its operations out of India. With a stronger, more intense taste, they are the leading cola soft drink brand in Mumbai, as well as the country. After a 3-way fight between Thums Up, Coca-Cola, and Pepsi (when the international brands returned to the country in 1993), Thums Up was eventually bought over by Coca-Cola. 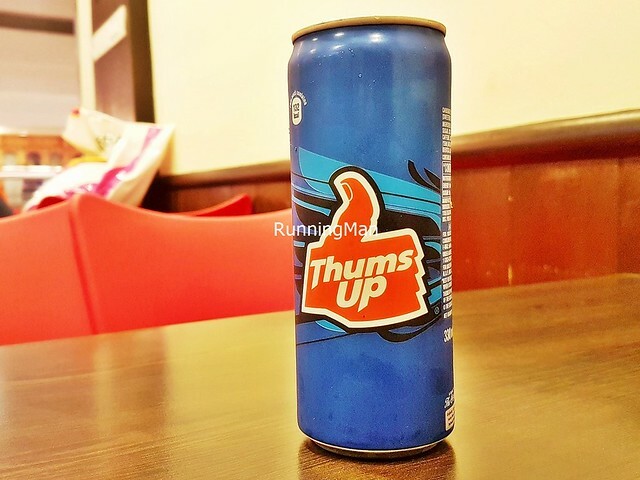 Thums Up is well known as a good mixer for rum-based alcoholic beverages. 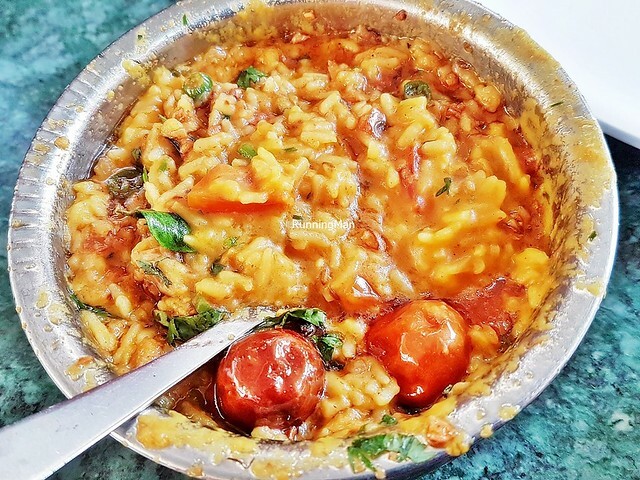 The Dal Khichdi / Dhal Khichdi is a wholesome and delicious 1-dish meal, made by slow cooking / pressure cooking short grain white rice / basmati rice in a thick gravy of water, mung beans, tomato, okra / lady's finger, and ginger, along with spices such as powdered cumin, powdered turmeric, salt, powdered asafoetida / asafetida, pepper, and chili. 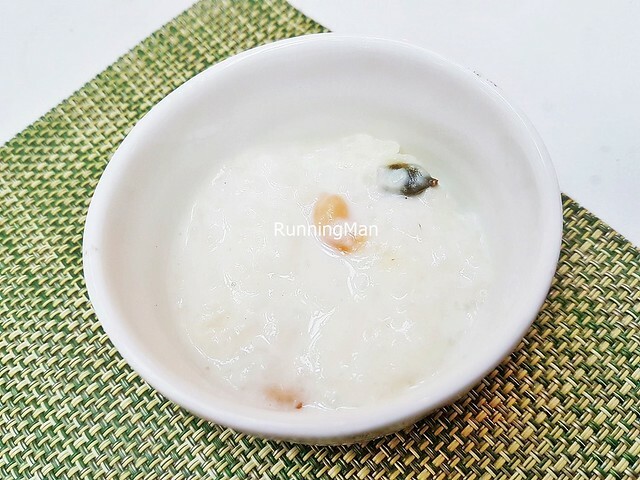 The result is a flavourful rice bowl with a sticky texture similar to congee. 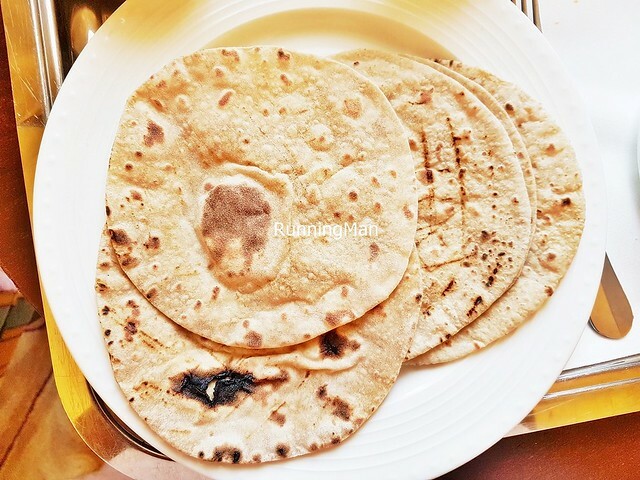 When people in Mumbai are unwell, they usually eat this as a comfort dish that is light and easy on the stomach. 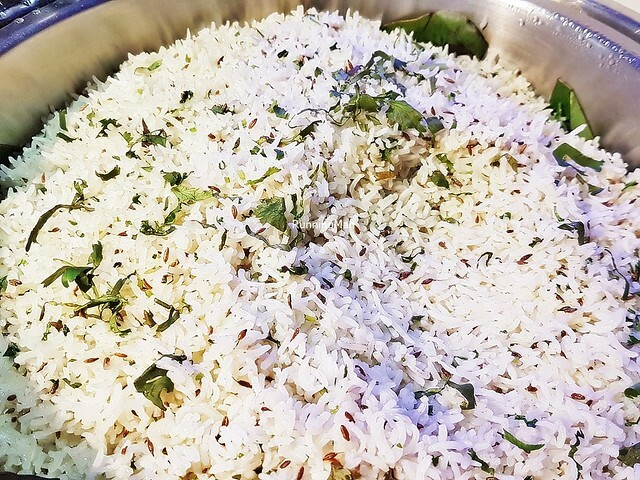 The Jeera Rice is also known as Zeera Rice, and features long grain white rice / basmati rice, steamed with fried cumin seeds, salt, and water, then garnished with onions and finely chopped coriander. 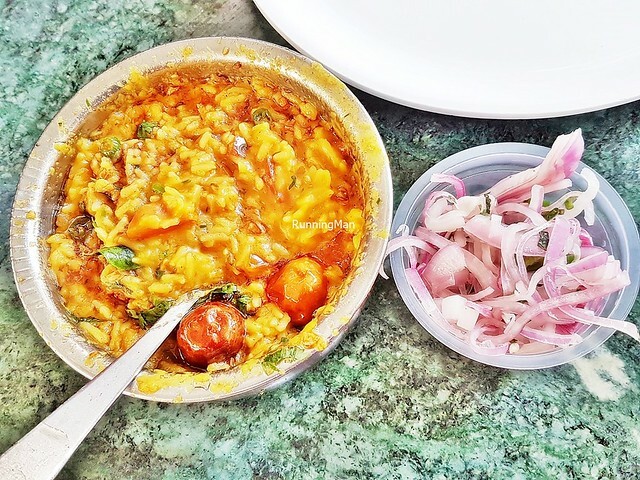 This is a popular, everyday dish in Mumbai, India, as it's easy to prepare and goes well with most curries. 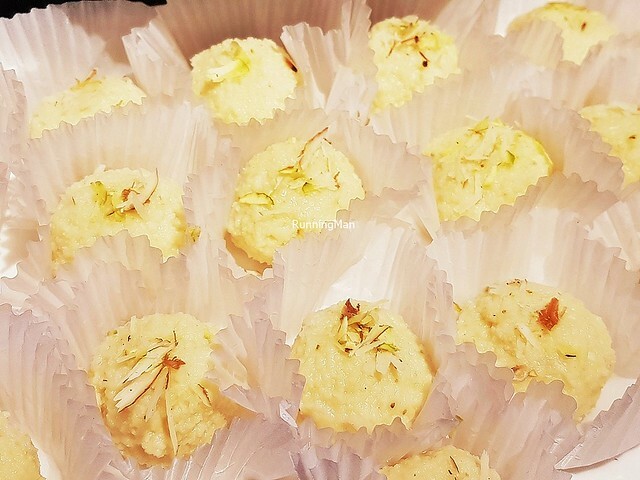 The Malai Peda is an Indian dessert, commonly eaten in celebrations or festivals. 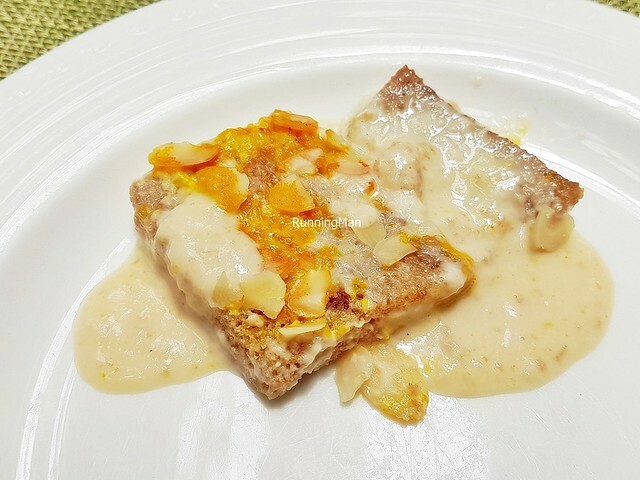 It's made with condensed milk, curdled milk spiced with saffron, sugar, cornflour, lemon juice, powdered cardamom, chopped pistachios, and chopped almonds. It has a grainy texture which crumbles easily in the mouth, with an intense sweet floral nutty flavour. The Methi Chaman usually resembles a Palak Paneer in looks, but a recent version I had is a spin-off style which does not use spinach. 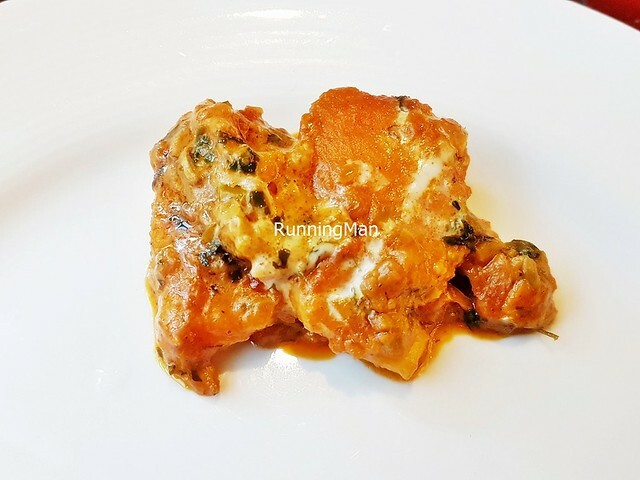 Instead, paneer / cottage cheese cubes are cooked with cumin seeds, onions, garlic, fenugreek leaves, tomato, powdered turmeric, salt, chili, plain yoghurt, cashew nuts, and fresh chopped coriander leaves. This rich, thick curry is savoury sweet, and goes well with rice or bread. 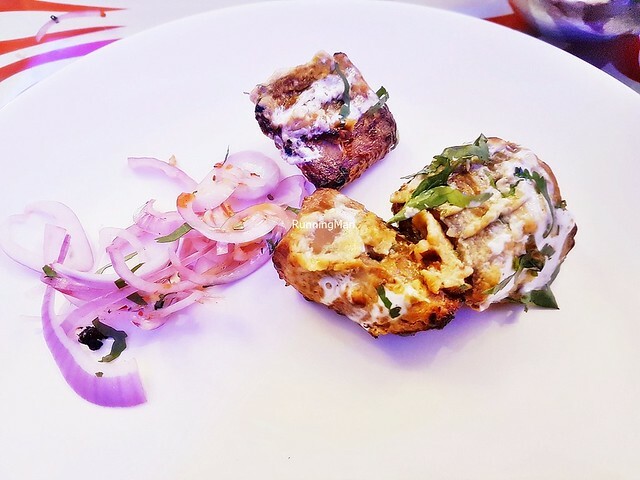 The Mutton Irani Boti Kebab is a delicious meat dish served as an appetizer. 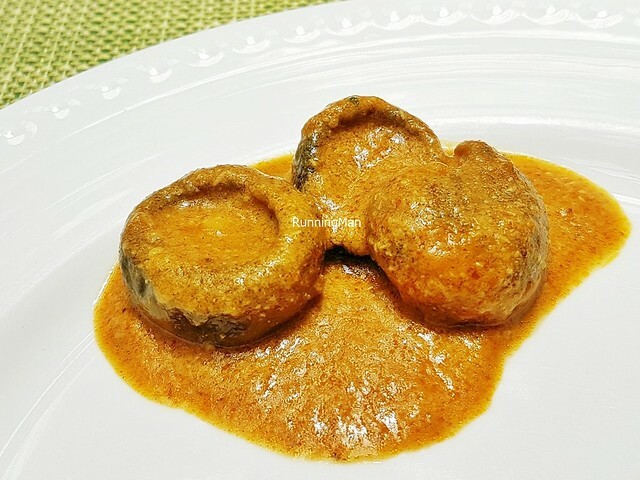 Cubes of mutton are cooked in garlic, ginger, salt, cumin seeds, powdered cardamom, powdered rose petals, black pepper, mashed papaya, poppy seeds, powdered cloves, powdered cinnamon, nutmeg, bay leaves, plain yoghurt, coriander leaves, and mint leaves. 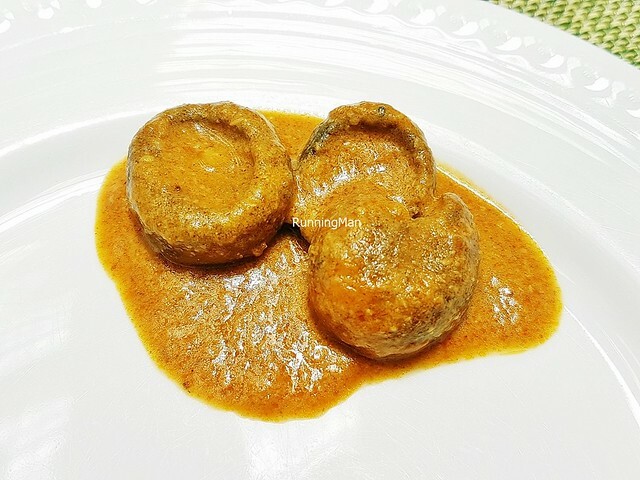 The savoury salty meat has a burst of sweet freshness with an undertone of fruity and spice. Bold flavours, non-gamey, with a tender, chewy texture. 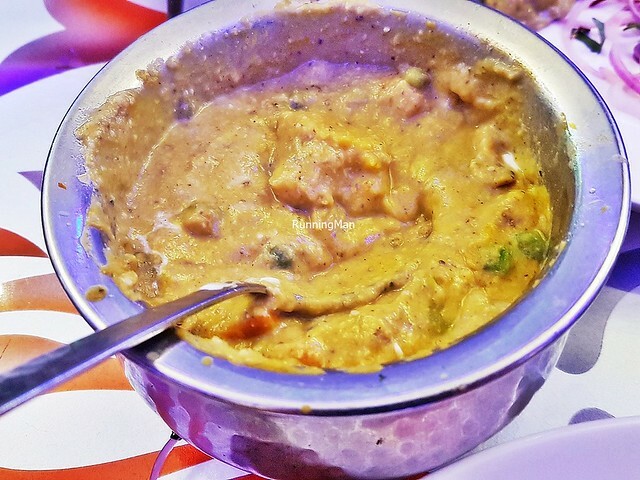 The Navratan Korma is a popular North India vegetarian curry, a rich, creamy sweet savoury dish that is mildly spicy. Its name is a tribute to the 9 advisors of Mughal Emperor Abu'l-Fath Jalal Ud-Din Muhammad Akbar / Akbar The Great, because it features a medley of 9 vegetables, including carrots, peas, potato, string beans, cauliflower, corn, onions, pineapple, and tomato. The vegetables are cooked along with ginger, garlic, plain yoghurt, powdered turmeric, water, salt, ghee / clarified butter, powdered cloves, powdered cinnamon, black pepper, bay leaves, powdered coriander, powdered cardamom, nutmeg, poppy seeds, chopped almonds, chopped cashew nuts, chopped pistachios, honeydew melon seeds, and chili. 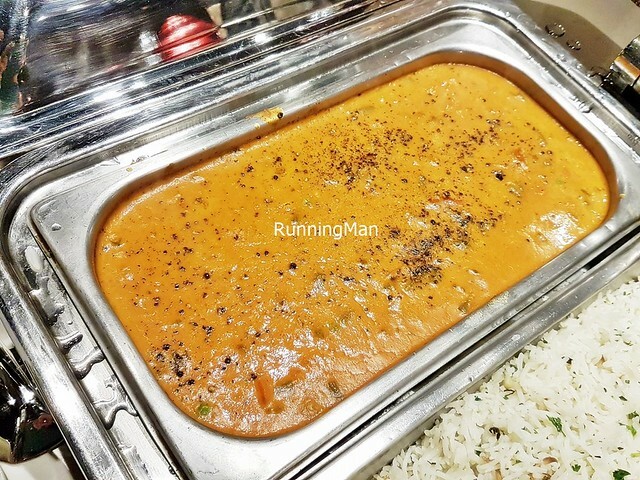 The result is a royal curry fit for an Emperor. 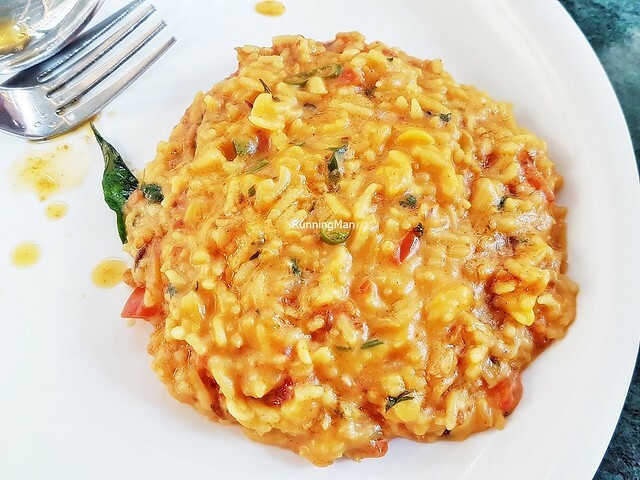 The Nizami Subz Handi is a vegetable dish that features a rich, savoury sweet cashew nut curry. 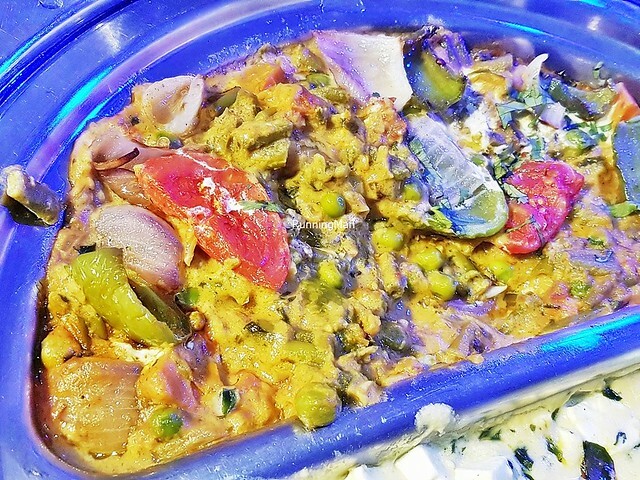 Made with peas, bell peppers / capsicum, tomato, onions, and eggplant / aubergine, in a curry of cashew nuts, fenugreek, salt, plain yoghurt, powdered turmeric, garlic, ginger, powdered cloves, powdered cinnamon, black pepper, bay leaves, powdered coriander, powdered cardamom, nutmeg, mint leaves, ghee / clarified butter, and coriander leaves. 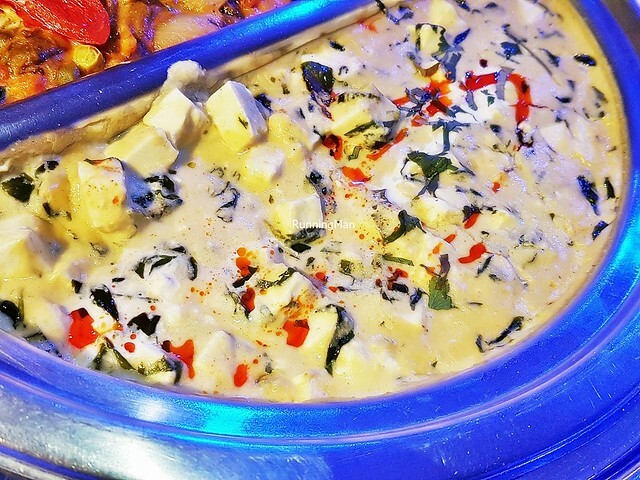 The Paneer Kalimiri Tikka is an appetizer of roasted cottage cheese, and I absolutely loved it. 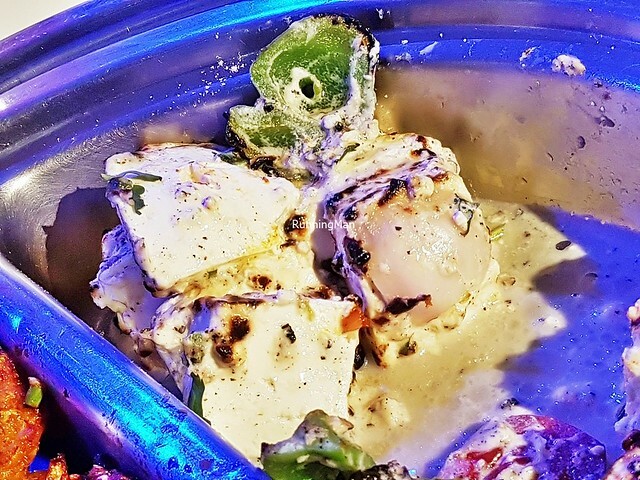 Made with tandoor oven roasted paneer / cottage cheese cubes, which have been marinated in plain yoghurt, black pepper, salt, crushed cashew nuts, garlic, and ginger. Lovely smokey aroma, light savoury sweet taste, and a soft texture. 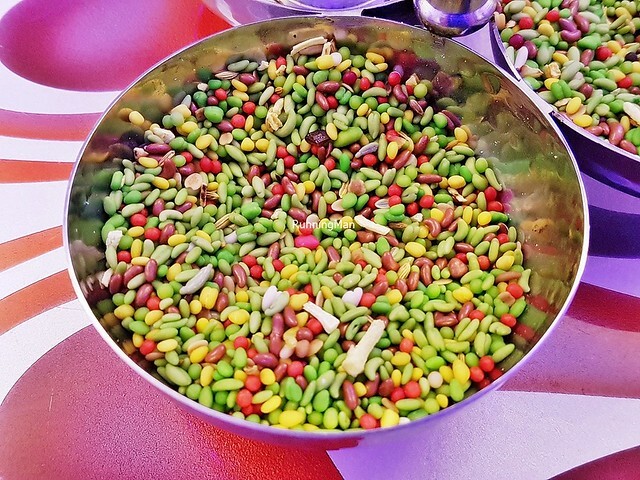 A traditional Indian after-meal snack, breath freshener, and digestive aid, the colorful Sauf / Mukhwas is made with various seeds and nuts, such as fennel seeds, fenugreek seeds, anise seeds, coconut, and / or sesame seeds. The mix is also sweetened with sugar, and enhanced with fragrant essential oils such as peppermint oil. 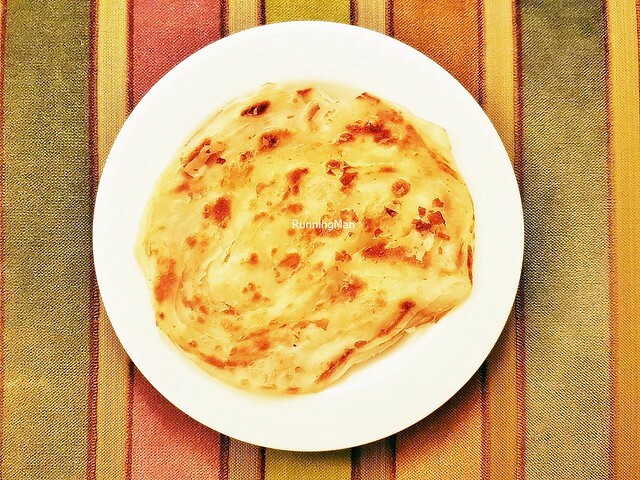 The Veechu Parotta is a type of Indian bread from Chennai, Tamil Nadu, India. 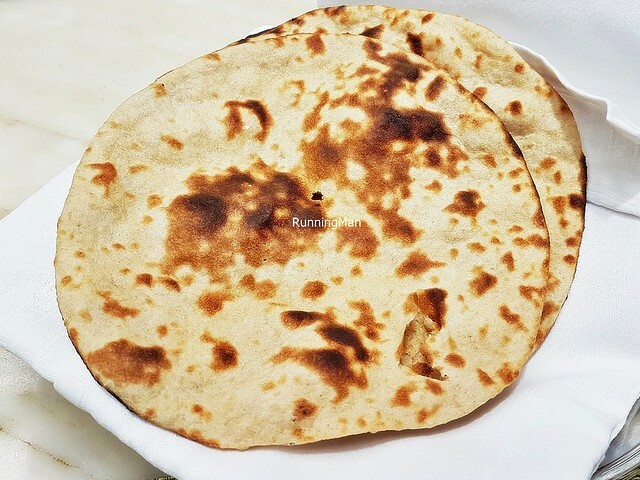 It's made with a dough that has wheat flour / plain white flour, salt, water, egg, milk, sugar and clarified butter (Ghee). 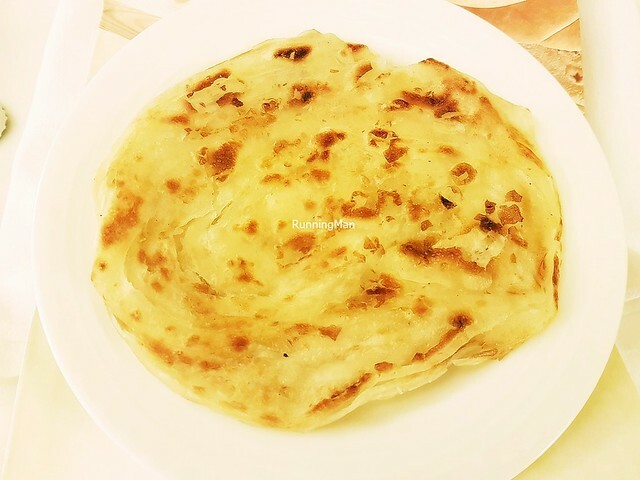 It is flipped and tossed, then quickly pan-fried, resulting in a warm, thin, crisp, buttery texture. Additional ingredients can be stuffed within. 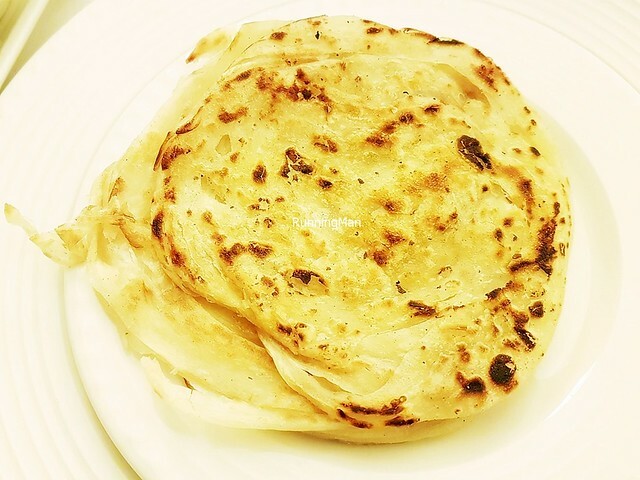 In Singapore, this is known as Roti Prata, while in Malaysia, this is known as Roti Canai. 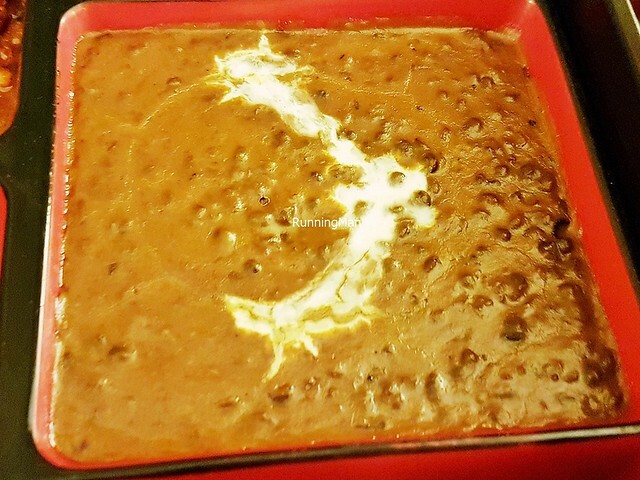 The Dal Makhani / Dhal Makhani is a popular Punjabi staple food. It's made with whole black gram beans (Vigna Mungo / Urad), red kidney beans, salt, ginger, powdered cumin, ghee (clarified butter), onions, tomatoes, garlic, chili, cinnamon, cloves, pepper, powdered cardamom, powdered turmeric, coriander, and garam masala. It is usually pressure cooked, as the normal process of frying can take up to 24 hours. Served to accompany nearly every meal here. 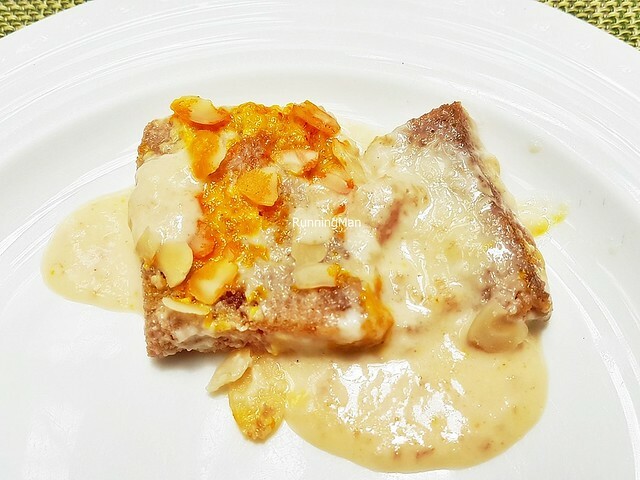 The Shahi Turka / Shahi Tukda / Shahi Toast is a rich bread pudding garnished with nuts. 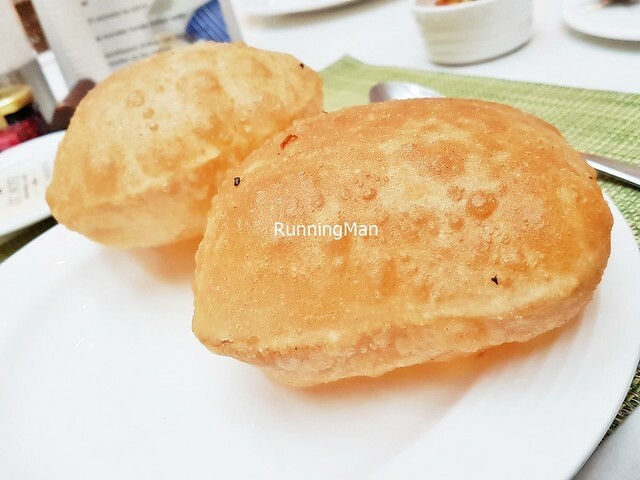 Orginating from Mughlai cuisine, this sweet and unhealthy Indian dessert is made by deep frying crustless white bread in oil till golden brown, then coating the bread in a syrup made from sugar, water, saffron, and condensed milk. Finally, it is garnished with raisins, sliced almonds, chopped pistachios, powdered cardamom, or more saffron. Sometimes, edible silver leaves are added. 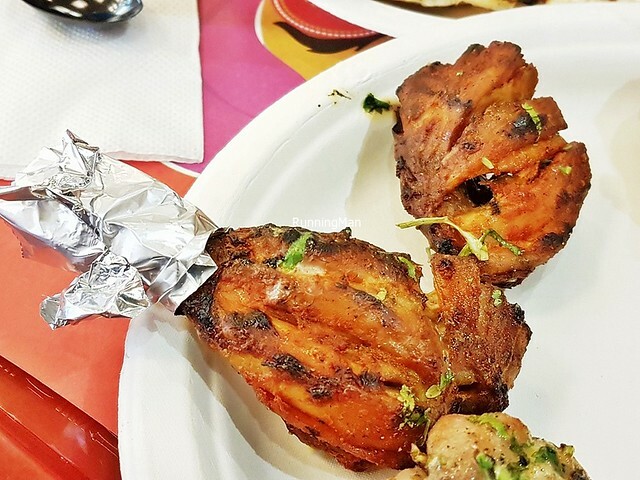 The Tandoori Chicken is among the most well-known, classic, iconic, traditional Punjab dishes. 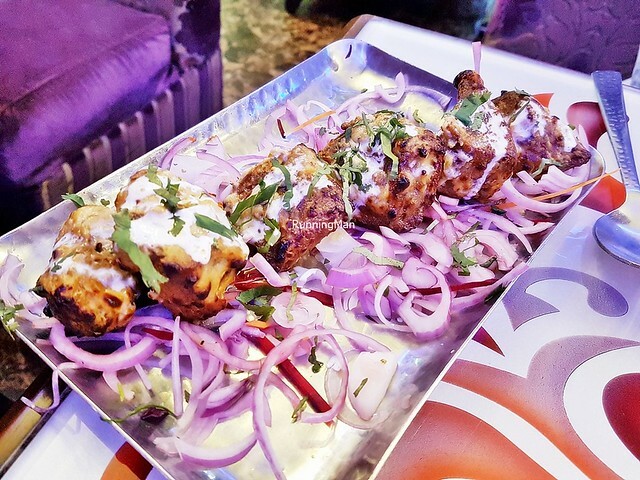 Pieces of bone-in chicken are marinated in a blend of plain yoghurt, garlic, ginger, onions, pepper, lemon juice, cloves, cinnamon sticks, cumin seeds, cardamom, and garam masala. 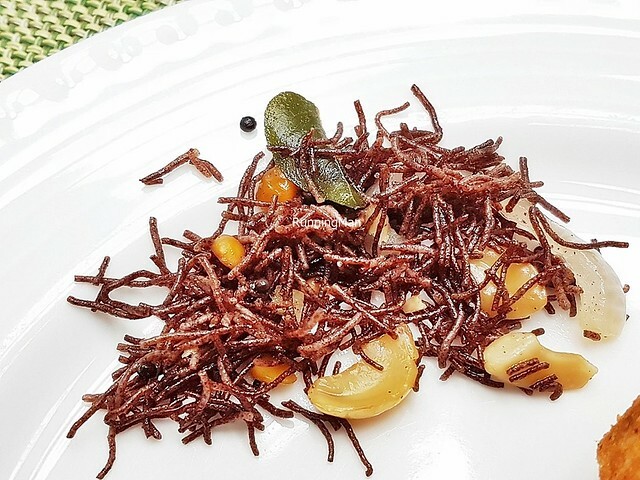 Sometimes, additional ingredients are included, such as star anise, fennel seeds, chili, mustard seeds, sesame seeds, corainder, malibar leaves, or edible orange food colouring. 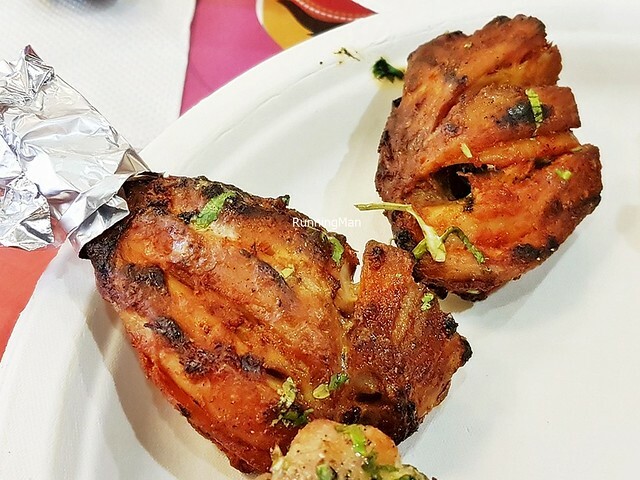 Roasted in a tandoor oven, the chicken meat is tender, with a sweet savoury flavour. 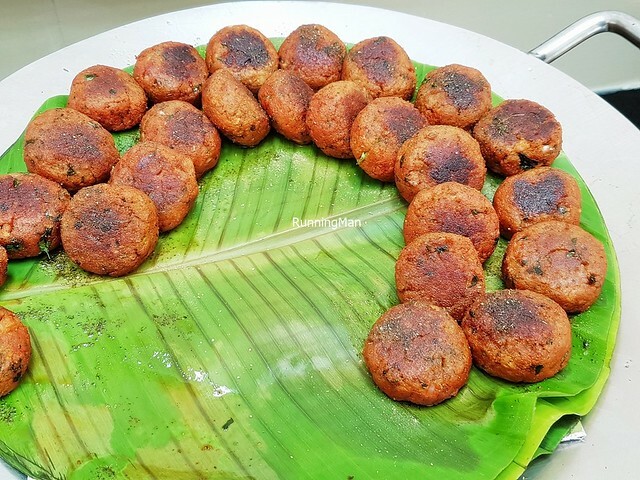 Seekh Kabab / Seekh Kebab, also known as Mutton Seekh Kebab, originated from the Middle East, Persian cuisine, and is made of minced mutton, onions, chili, garlic, ginger, coriander leaves, powdered cumin, pepper, salt, cloves, powdered cardamom, cinnamon, powdered nutmeg, and garam masala. 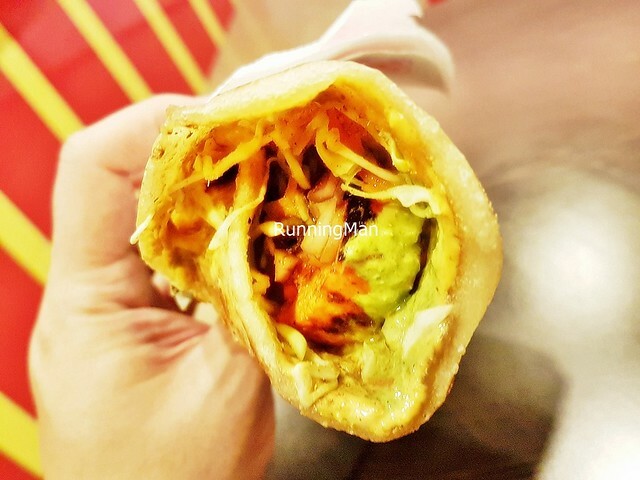 It is typically rolled and grilled on skewers in a Tandoor oven. 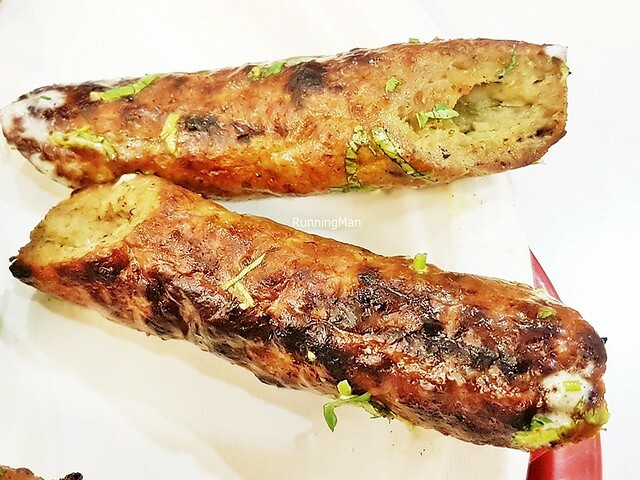 A good Seekh Kabab / Seekh Kebab / Mutton Seekh Kebab should be moist and juicy, not dry. It is served garnished with lemon juice, and with a yoghurt dip or mint sauce. 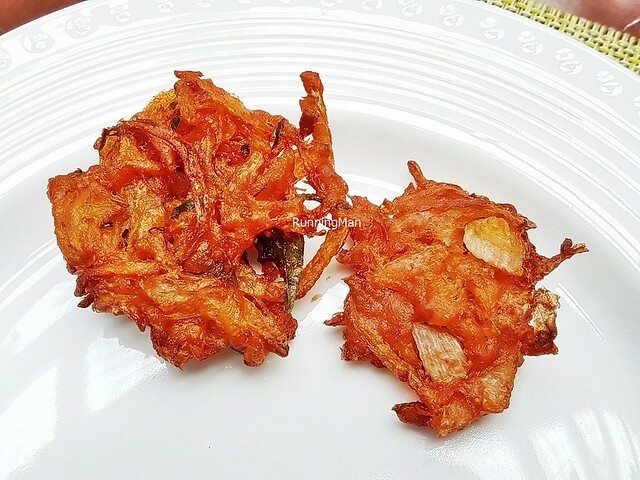 The Kanda Bhaji is a tasty onion and chickpea fritter, commonly served as a snack. It's made with gram / chickpea flour, onions, curry leaves, powdered turmeric, powdered cardamom, and chili. 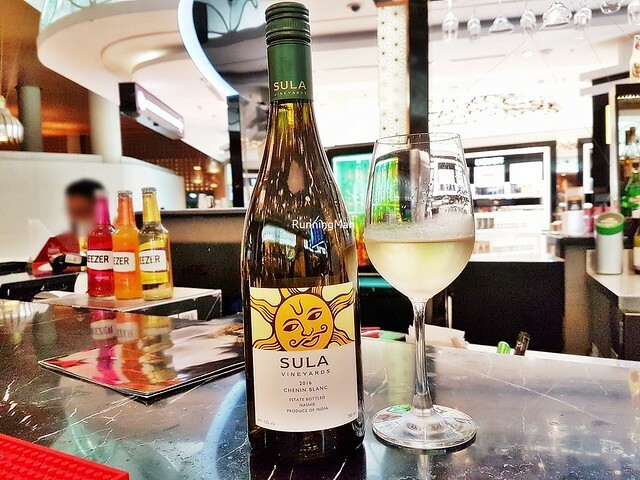 Has an earthy savoury sweet flavour, with a hint of spicy kick. 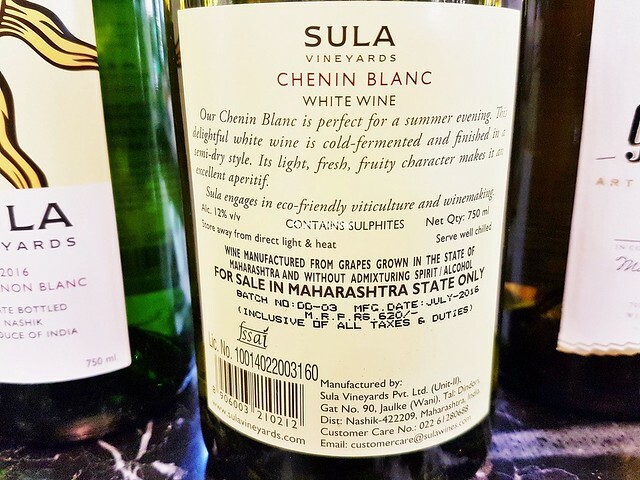 Wine in India is newer than new world. 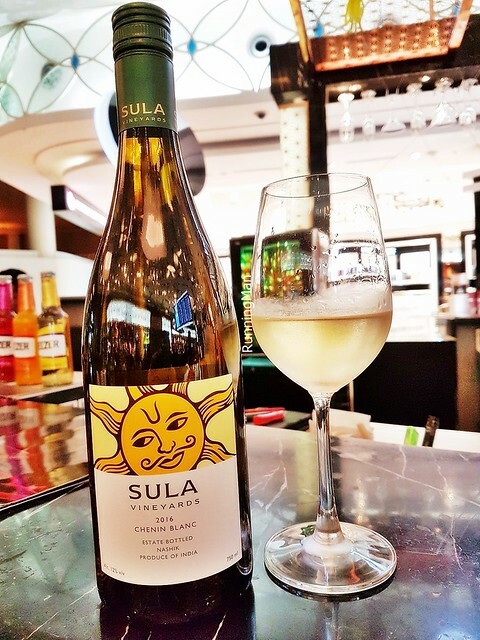 The Wine Sula Vineyards Chenin Blanc is a white wine, made by Sula Vineyards in Nashik district, in the Maharashtra region of India. It has a pale yellow white colour, with aromas of granny smith apples, quince, pineapple, and apricot. Body is light, refreshing, semi-dry, with a medium acidity that is balanced with a crisp sweetness. 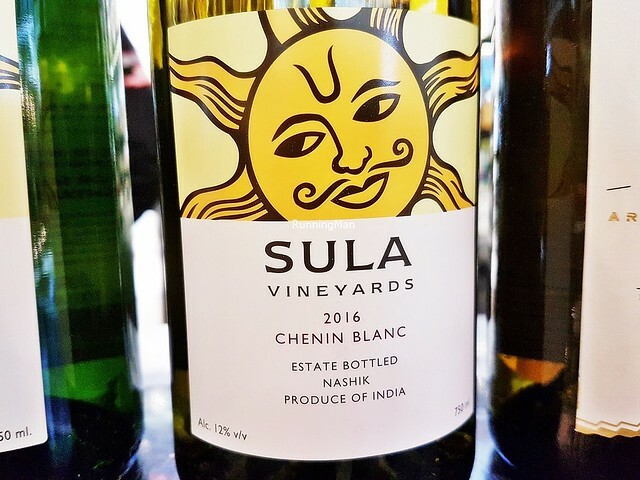 Tastes of pear, chalk, peach, and green apples, fruity and delightful. Finish is short and quick. Unique character, makes for an excellent aperitif. 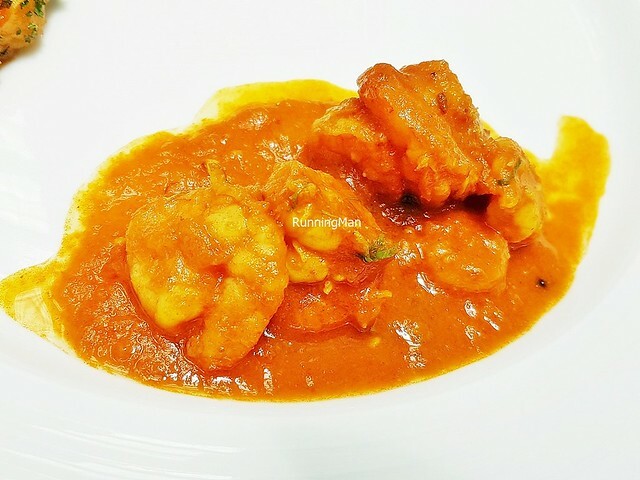 The Royyala Pulusu is a well-known seafood dish, made with fresh deshelled prawns / shrimp, tomatoes, onions, curry leaves, coriander, mustard seeds, powdered turmeric, tamarind juice, salt, coconut milk, mango, and chili. This wet curry dish has a tangy, sour sweet spicy flavour, with a meaty chew to texture, and a rich, creamy mouthfeel. Feels incredibly luxurious. 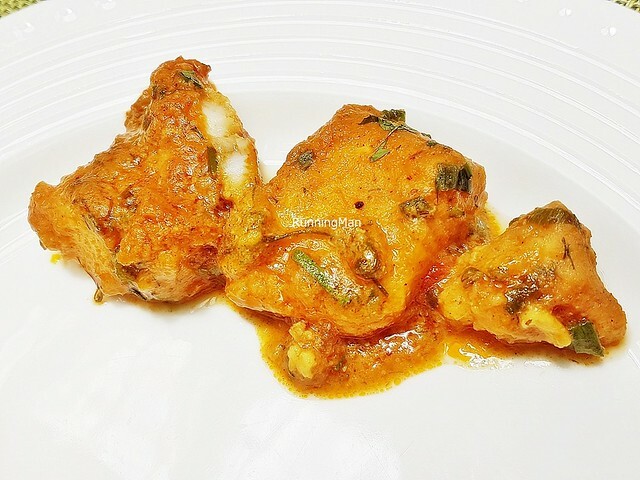 The Thande Masale Ki Machli is a rare fish dish, usually served only for special occasions in East India. A large, fresh, deboned fillet of carp fish is slow cooked with mustard seeds, garlic, powdered coriander, powdered mango, powdered turmeric, onions, lime juice, salt, fenugreek seeds, fennel seeds, mustard oil, and chili. 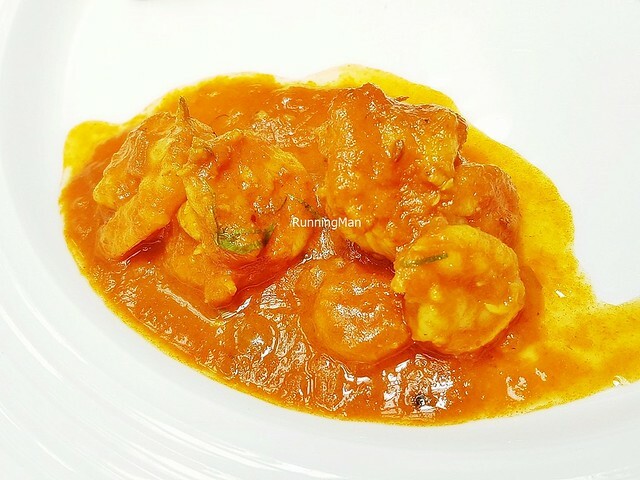 The fish has a tender, flaky, almost creamy texture, with the wet onion curry having a savoury sweet spice flavour. Very satisfiying. 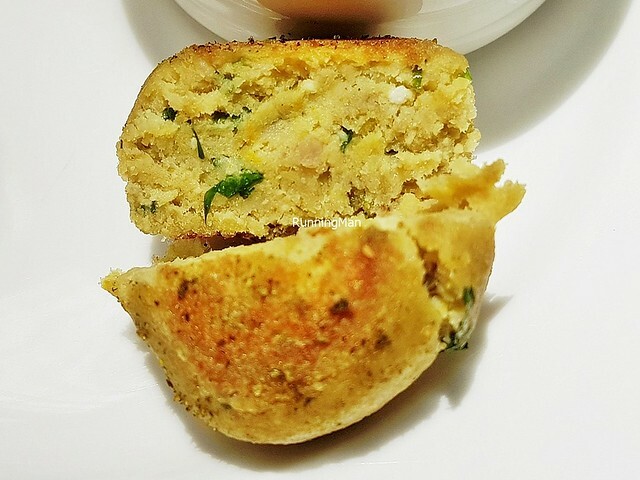 The Kothimbir Vadi is basically a coriander fritter, popular as a snack. It's made with gram / chickpea flour, powdered turmeric, ginger, coriander, sesame seeds, salt, powdered asafoetida / asafetida, crushed peanuts, and chili. 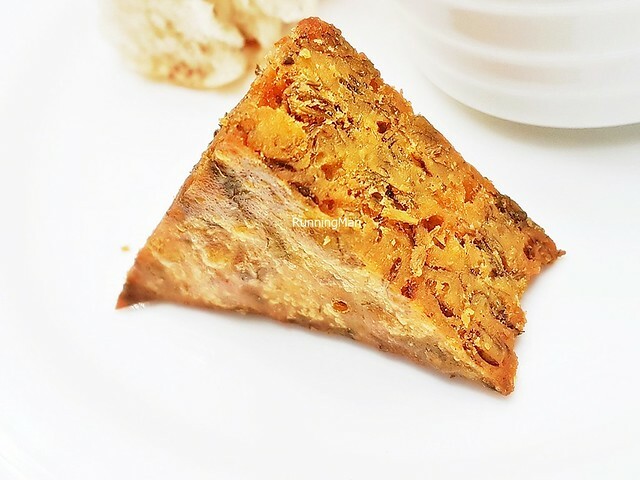 It has a crumbly, grainy texture, with a herbal earthy savoury flavour. 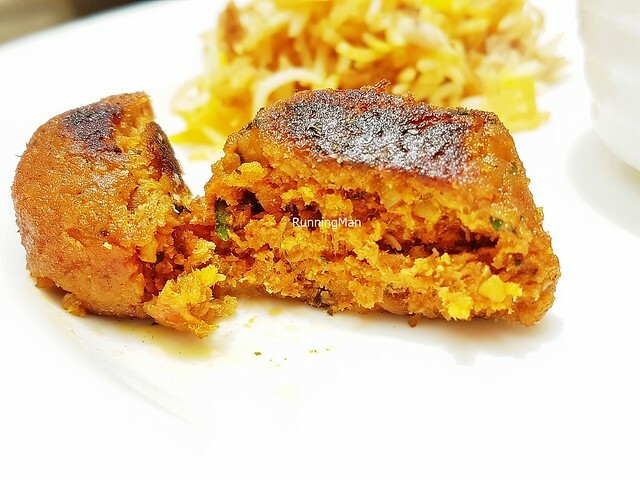 The Dum Ki Kumbh is a modern dish, having only been recently created over the last few years. Stir-fried button mushrooms are simmered in a Kashmiri style gravy of cashew nuts, fennel seeds, ginger, garlic, onions, powdered coriander, powdered cumin, powdered turmeric, salt, coriander, yoghurt, and chili. Texture is rich, creamy, grainy, with flavours of earthy nutty sweet savoury. 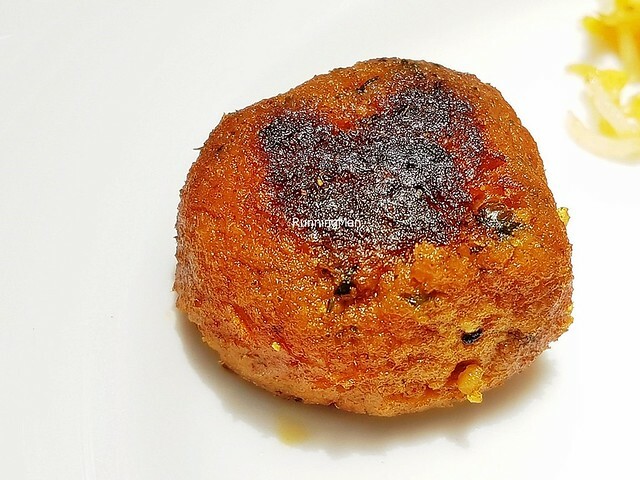 The Murgh Shami Kebab is akin to a little, round chicken meat ball. 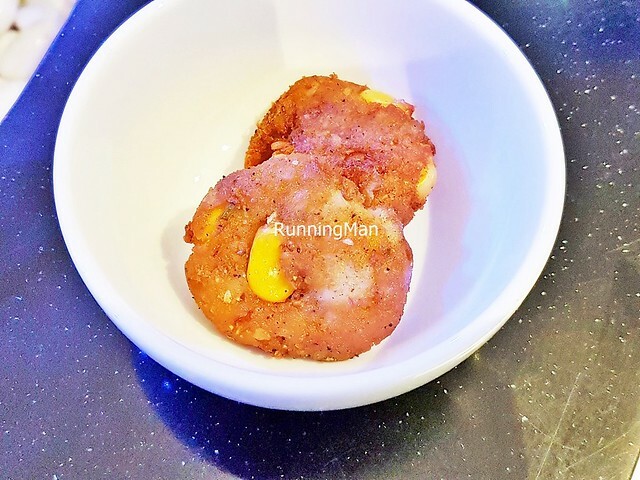 Soft and delicious, these are made with minced chicken meat, garlic, ginger, salt, onions, coriander, gram / chickpea flour, potato, powdered cumin, powdered turmeric, lemon juice, eggs, and chili. 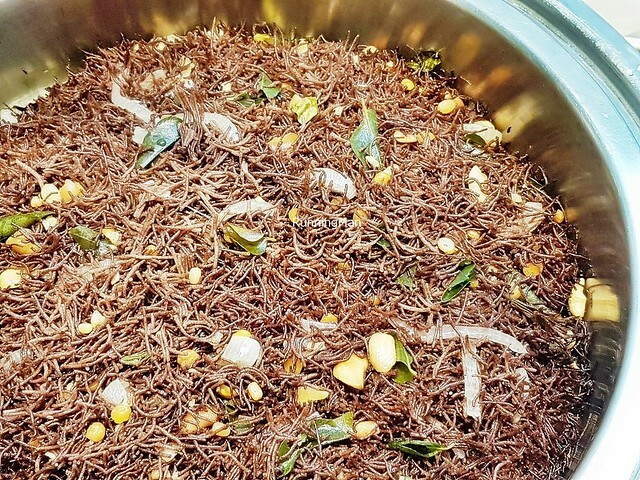 Can be eaten as a snack, or as part of a meal. 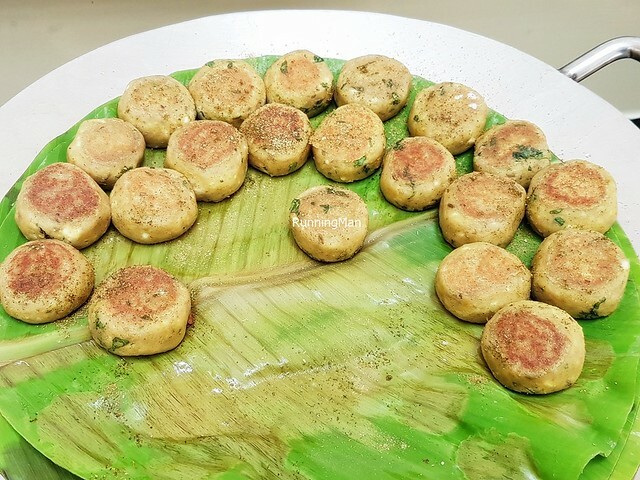 The Phaldari Kebab is a delicious vegetarian kebab, made with potatoes, yam / taro, banana, garlic, ginger, salt, semolina, rice flour, and chili. It has a crumbly grainy texture, with a sweet earthy vegetal flavour. Yummy! 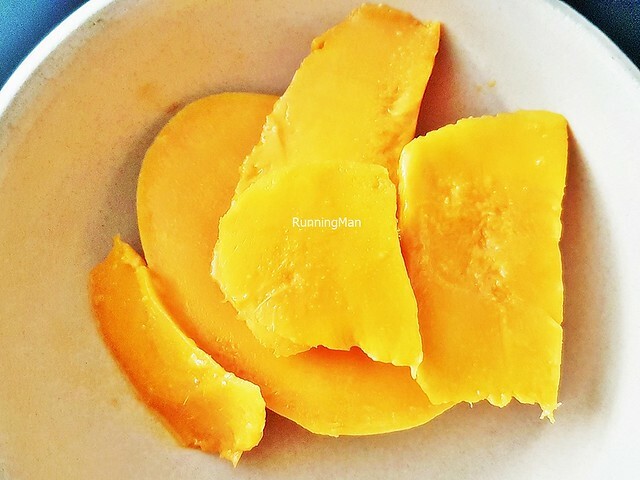 Mumbai is well known for its Alphonso Mango, considered to be the world's sweetest. Though small, those grown in the Ratnagiri district are sweet and juicy, with a bright orange yellow flesh that is completely luscious and delicious. 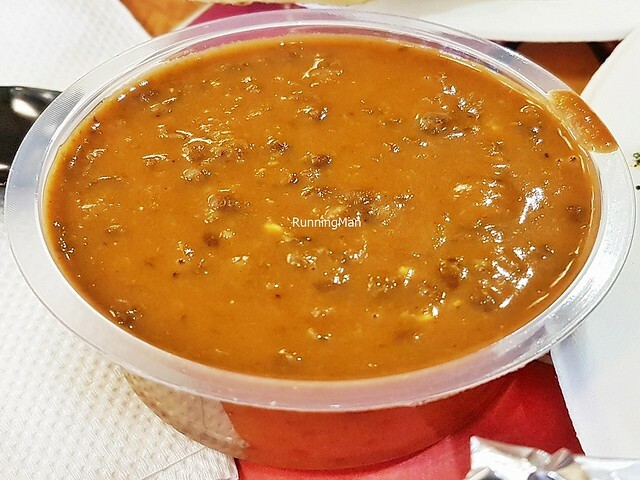 The Sevaiyaan Ragi is made with rice flour vermicelli, salt, water, onions, curry leaves, black gram bean flour (Vigna Mungo / Urad), mustard leaves, peanuts, and chili. 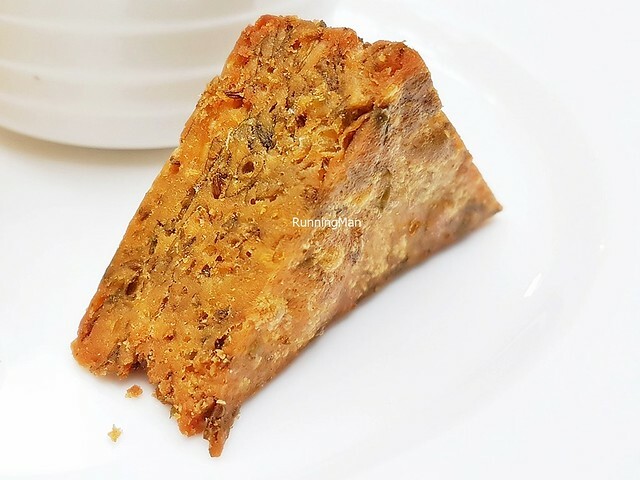 It has an earthy savoury flavour, with an alternating texture of soft chewy and hard crunchy.